I’m having a hard time with Christmas this year. No need to go into all the reasons. Suffice to say, it’s been a crappy year all around. I see people getting all giggly and hopped up on “Holly Jolly Christmas” and I want to whack them with boughs of holly. I take that back, I don’t want to hurt anyone. I just don’t want to have that elfin joy all up in my face. It’s not that I don’t like all that holiday cheer. I usually love lights and sparkly stuff. And Christmas carols – I could sing Chritmas carols all night long. Just not this year. This year sucked. Oh I know all about having an attitude of gratefulness. And counting my blessings. And don’t dwell on the bad stuff, think of all the good stuff. And most of the time, that’s how I look at things. But not now. Now I’m tired and hurting and don’t feel like being at all cheerful. It’s not that I’ve lost Christmas. It’s just been hiding. But the other day, it peaked it’s “God bless us all” head out of the dark clouds. I have a friend who I know from Grand Central Station. His name is Will. He doesn’t live there exactly. He’s homeless actually. I call him friend because over the past year, I’ve gotten to know him. I talk to him in the mornings or evenings when I pass through on my way to or from my train. He has a little beagle named Rizzo and I stop and pet her. He sleeps on the subway or in a hostle if he can get enough cash. He has a friend named Celia who works in the neighborhood who helps him out. She’s tried to find him housing and work. He actually has a regular group of us, women mostly, who stop and talk. We bring him and Rizzo supplies and give him a few dollars everyday. On Friday as I was headed to work, I saw him and stopped to chat. There was another one of his regulars talking to him. I recognized her but don’t know her name. While we were standing there, yet another stopped by briefly and gave him some cash. I noticed he had all this stuff piled up. “Yeah”, he said. “People have been bringing me all sorts of things. I got two new blankets. One I can roll up and tie on my luggage wheels. The other I can put in the carrier for Rizzo. She loves it. It keeps her nice and warm. And I got a whole box over here of food for both of us. Problem is, I can’t carry all that food.” So I asked him what he would do with it. “I donate it to the church.” he said. Bang! There is was. Right in front of me. Christmas. And not an elf or reindeer in sight. Just people caring about each other. I suddenly felt happier than I have in a long time. I had to rush off because I was late. I hugged him and gave him a ten and told him I hoped he was able to get enough to stay in the hostle that night. It was going to be cold. All the rest of that day, I found myself humming John Lennon’s “Happy Christmas”. Tonight, my husband and I are going to watch “Rudolph”. Tomorrow night, we’ll watch “Christmas Vacation”. Maybe, in another week, I’ll be ready to spread some cheer. Not quite yet. But I’m getting there. 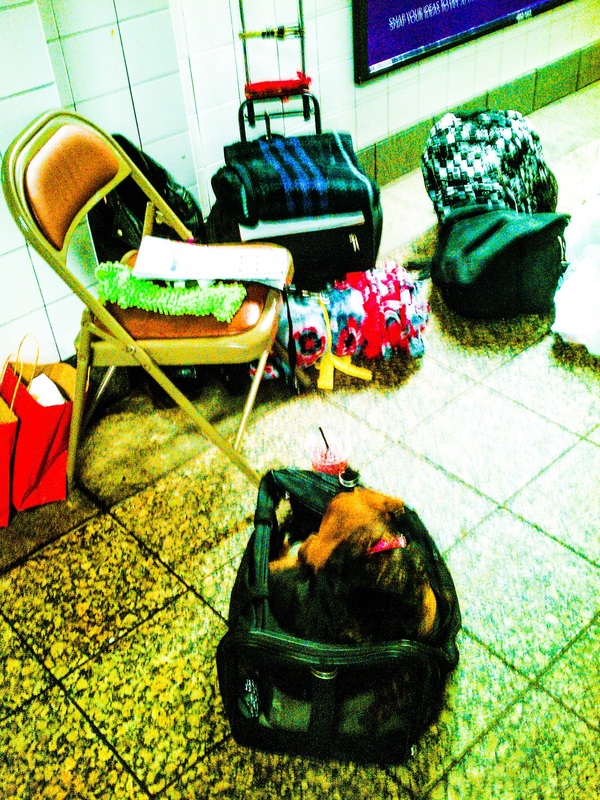 This entry was posted in Commute, compassion, Daily Life and tagged Christmas. Bookmark the permalink.